The last show I did was four years ago, after the first year of my diagnosis. I hadn’t thought about returning to the stage until a director friend of mine asked if I would be interested in being in his show as the lead. I hesitated, unsure if the old lady would grant me the energy for rehearsals and performance. The challenge for me was not the multitude of lines I’d have to memorize (hoping that old RA fog would subside) but the ability to lift and carry a tray of glasses for each show. I was not sure my hands would cooperate; despite my misgivings, I agreed to do it. During rehearsals, I learned to reign in the frantic movement of my anxious character, to cautiously lift the tray, in spite of my shaking hands; the glasses, the ones we had been warned not to break for they were required for the full run of the show, clanked ominously against each other night after night. Each performance, I dreaded that moment, hoping that I would not need to deal with the consequence of one of those glasses sliding from the precarious tray in my hands. Somehow, over the weeks, I managed to complete my task, with only a few near misses. In the final performance, I handed the tray to the stage manager for the last time, and celebrated a tiny victory. I had successfully stemmed the tide of the old lady, like a lion tamer commanding the wild fierceness of his cats; I had mustered the energy to restore a part of my life altered by arthritis. I started acting when I was eleven, and haven’t left the stage since. I’ve always been a theatre actress, although I did a small bit of film way back when. It felt good to return to the stage, and even better to fight through and succeed. How wonderful that you were able to participate in an activity that you enjoy. May the old lady stay behind the curtain where she belongs. Always knew you were talented. 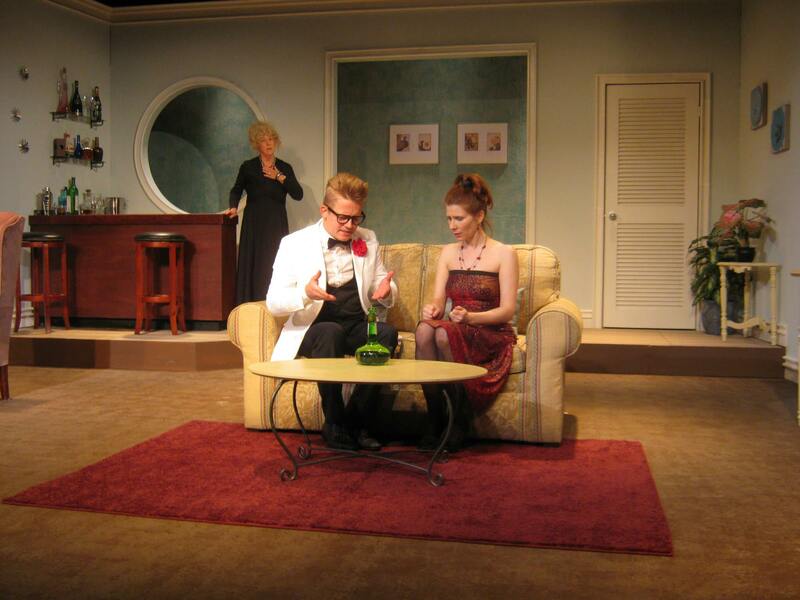 To pull of a leading character in a play and have to show up for each performance is quite an accomplishment. It’s funny what we count as victories that pre-RA we’d never think twice about. I’m so pleased for you. Here’s hoping the old lady stays gone! Not a tiny victory at all, taming the old lady is like taming a lion! I’m so glad that the “Old Lady” didn’t nag you off the stage. If all that stood in the way of your performance was the fear that you would shake the glasses off the tray, there are ways around that. (Blu Tack comes to mind.) The weight of the tray would be my challenge. By the way, what was the title of the production? Marianna, the production was called “Let’s Murder Marsha”. It was a super charged comedy, I played a wife obsessed with mysteries and overheard a conversation between her husband and another woman where I mistakenly concluded he was planning to murder me – really, he was planning a birthday party. It was a fun challenging role. And I look forward to my next challenge on the stage.